Last month I sang the praises of The Essential One and their range of newborn clothing essentials. One of the other areas in which The Essential One specialises in is baby snowsuits. 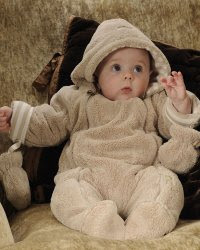 Most of the snowsuits at theessentialone.com cost £28 and they are all wonderful quality. Soft, snuggly and easy to get on. Until the day after Lara was born, I didn't really grasp quite how warm and snuggly a newborn baby needs to be kept - a snowsuit isn't just for use in the very frozen depths of winter! The Essential One snowsuits are available from first size (7lbs) all the way up to 12 months old (although I should warn you that trying to get a snow suit on a 1 year old is no mean feat - they are phenomenally wiggly by then!). The snowsuits have two full zip openings for easy access, a toasty warm hood and detachable mittens. I really really LOVE the supersoft fluffy fabric and the really soft cotton lining; in fact, what I really want is one of these for me!